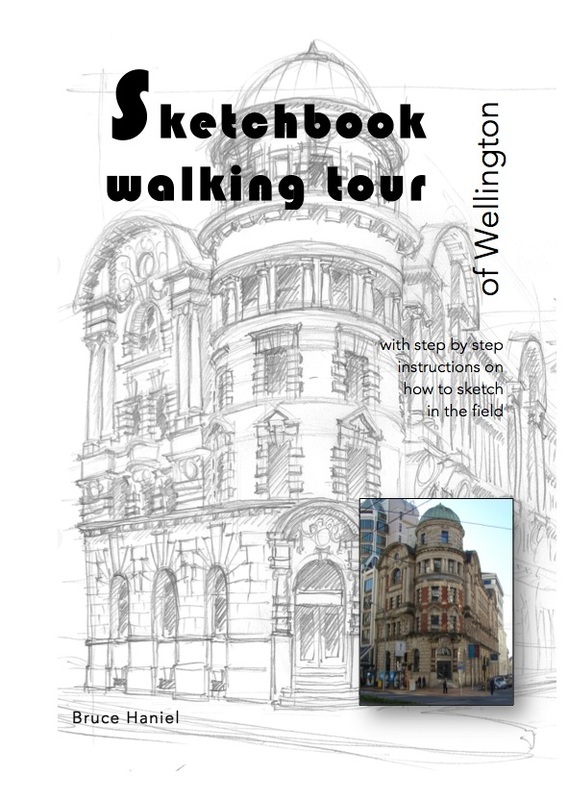 Sketchbook Walking Tour of Wellington is a guide for people interested in the historic and modern architecture of Wellington and/or urban sketching. Its attractive ‘art book’ look also lends itself to use as a coffee table book and tourists momento. Each building is briefly described by date, architect and architectural style.Then there are drawing hints and a colour photograph followed by the authors sketch.The sketch has ‘construction lines’ left in to assist the novice artist and to lend it an informal character. The second part is an illustrated guide to sketching employing the traditional approach of which there is little information commonly available but without which the novice is unable to achieve the correct proportions.This process has been informed by the authors twelve years teaching novices to draw at polytechnic and at ‘Hutt Art’. This section is followed by several blank pages and a stiff back cover for drawing apon. The book is wire bound A5 size.The canadian cover is on a parchment style card to give it an ‘art book’ character. This also makes it easy to find on a shelf as the spine is printed.The body is on 150gm. buff stock with a nice hand feel and which is good for drawing.